The Mull of Galloway (Scottish Gaelic: Maol nan Gall, pronounced [mɯːlˠ̪ nəŋ ˈkaulˠ̪]; grid reference NX158303) is the southernmost point of Scotland. 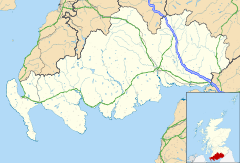 It is situated in Wigtownshire, Dumfries and Galloway, at the end of the Rhins of Galloway peninsula. The Mull has one of the last remaining sections of natural coastal habitat on the Galloway coast and as such supports a wide variety of plant and animal species. It is now a nature reserve managed by the RSPB. 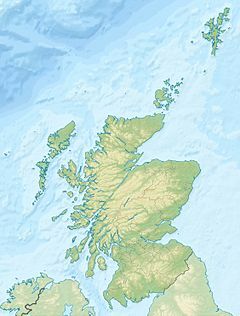 Mull means rounded headland or promontory. The Mull of Galloway Trail, one of Scotland's Great Trails, is a 59 km long-distance footpath that runs from the Mull of Galloway via Stranraer to Glenapp near Ballantrae, where the trail links with the Ayrshire Coastal Path. An active lighthouse is positioned at the point . Built in 1830 by engineer Robert Stevenson, the white-painted round tower is 26 metres (85 ft) high. The light is 99 metres (325 ft) above sea level and has a range of 28 nautical miles (52 km). The lighthouse and lighthouse keepers' houses are designated as a Category A listed building. The lighthouse is now automatic, and an old outhouse has been converted into a visitor centre, run by the South Rhins Community Development Trust, a group of local people and businesses. 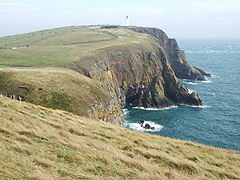 In 2013 there was a community buyout and the Mull of Galloway Trust purchased land and buildings, with the exception of the tower, from Northern Lighthouse Board. In 2004 a new café was built at the Mull of Galloway, called the "Gallie Craig". Its design incorporates into the landscape with a turf roof, giving views across to Northern Ireland and southwards to the Isle of Man. ^ "Mull of Galloway Trail". Scotland's Great Trails. Retrieved 2018-09-17. ^ Historic Environment Scotland. "Mull of Galloway Lighthouse, Lighthouse Keepers' Houses and boundary walls (Category A) (13578)". Retrieved 11 April 2019. Wikimedia Commons has media related to Mull of Galloway Lighthouse. This British lighthouse-related article is a stub. You can help Wikipedia by expanding it.